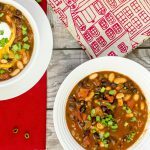 This vegetarian chili is a nod to those who have decided it was okay to not consume an entire cow each week. In my household of seven, we have agreed, with the exception of my oldest son (majority rules), to reduce our meat intake…to maybe one chicken and a couple fish. I’ll be honest here, we did not discuss the particulars of which or how many animals. I embellish, but the point is we decided to eat healthier, but not like rabbits. Note: we are not vegetarians, vegans, or a special variety of herbivore. We are omnivore and proud. (I kind of want to quote the X-men, and say “Mutant and proud,” but I refrain myself). With that backstory in place, I will quote my husband. “I never knew something without meat could taste this good.” -Vegetarian chili: Your mission is complete. As busy as I am with my job and a big family, I am one busy chica. With that said, if I can eek out the time to make it, you can probably find the time to make it too. This vegetarian chili fits the bill: easy, meatless, hearty, tasty. When I was talking about this black and white vegetarian chili with a co-worker of mine, she asked me why I called it that. I was taking the straight-forward approach. This chili has black beans and white beans…specifically cannellini and great northern beans. I used a can of both, but don’t feel boxed in with your white bean choices. Use what you have. Since I have young minions residing in my home, I cannot concoct fire-breathing chili potions as often as I’d like, so this vegetarian chili has a medium heat. Adjusting the spiciness is simple; for spicier chili add more chili powder, maybe some cayenne or your favorite hot sauce. If you find my medium spice is, in fact, fire-breathing chili potion to your taste buds and you would like to reduce the spice, try adding some extra sugar this time around so as not to waste it, and next time lay off the hot sauce or reduce the chili powder until you get your perfect seasoning. As I mentioned, my crew isn’t vegan, so some of us added cheese and sour cream (as denoted in the pictures). If you make this recipe, share it on social media. I’d love to see what you’ve done with it. Make it your own. Black and white beans, chili spices, and a robust undertone pull it all together in this comfort food classic. Dice/mince the vegetables (white onion, green bell pepper, garlic). In a large pot on medium heat, add 2 tbsp of olive oil. Add the vegetables to the oil and saute for 2-5 minutes until garlic is golden brown and onion/pepper are tender. To the same pot, add the rest of the ingredients: beans, green chilis, roasted tomatoes, tomato paste, chili powder, coriander, cumin, vegetable broth, hot sauce, and brown sugar. Adjust the herbs to taste if you would like it spicier or sweeter. Allow the chili to come to a boil and reduce heat to a low simmer. Let the chili simmer for another 25-35 minutes. Serve warm with cornbread or biscuits. Sprinkle green onions on top. Try using a slow cooker and letting it cook on high for 4 hours or low for 6-8 hours.